The Avanti East development is seen on East Owassa Road in Edinburg. EDINBURG — A new $18.4 million apartment complex will celebrate its grand opening next week. The developer, Madhouse Development Services Inc. of Austin, partnered with the city of Edinburg and Texas Department of Housing and Community Affairs to build Avanti East, a complex comprised of 108 units located at 1215 E. Owassa Road. “The Avanti East development is a high-quality, affordable apartment community for working families,” a news release from the developer stated. 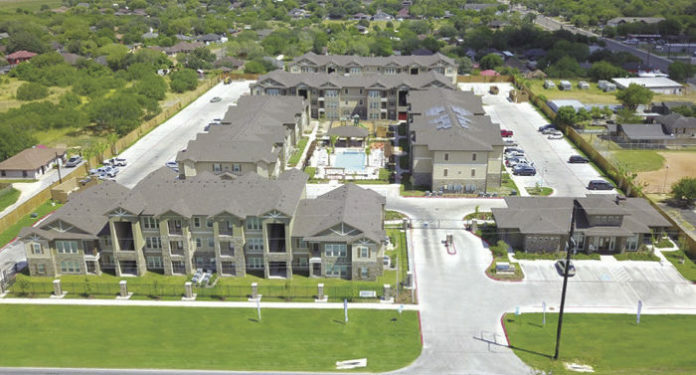 Madhouse received an allocation of housing tax credits through the Texas Department of Housing and Community Affairs and fee waivers from the city, the news release stated, but did not include details about the figures. The gated complex offers one-, two- and three-bedroom apartment homes, which include a variety of amenities such as Energy Star appliances and lighting, washer and dryer hookups, walk-in closets, ceiling fans, outside storage rooms, high-efficiency HVAC systems, microwaves, frost-free refrigerators with icemakers, and covered patios and balconies. The complex also offers a clubhouse facility with a fitness studio, a business center and an activities room. Outside, tenants can also find a swimming pool, barbecue areas and a fully fenced children’s playground. For more information, contact Alpha Barnes Real Estate Services at (956) 601-2198.